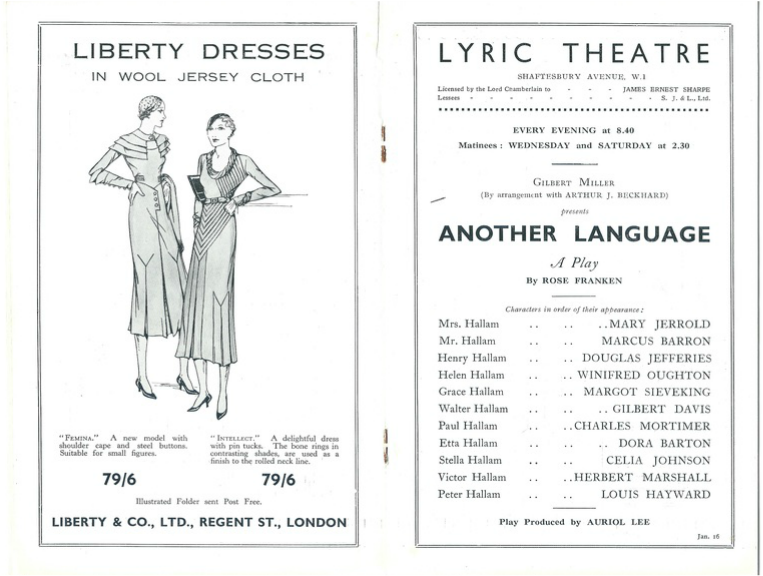 "Another Language" was performed at the Lyric Theatre, London, from 1 December, 1932, to 4 February, 1933, having firstly opened at the Palace Theatre, Manchester, from 14 November, 1932. 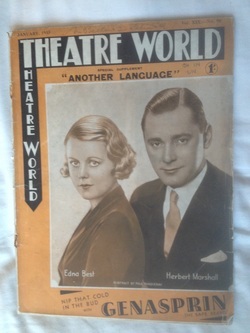 Theatre World from January 1933, headlining "Another Language"
From The Stage - Thursday 03 November 1932. 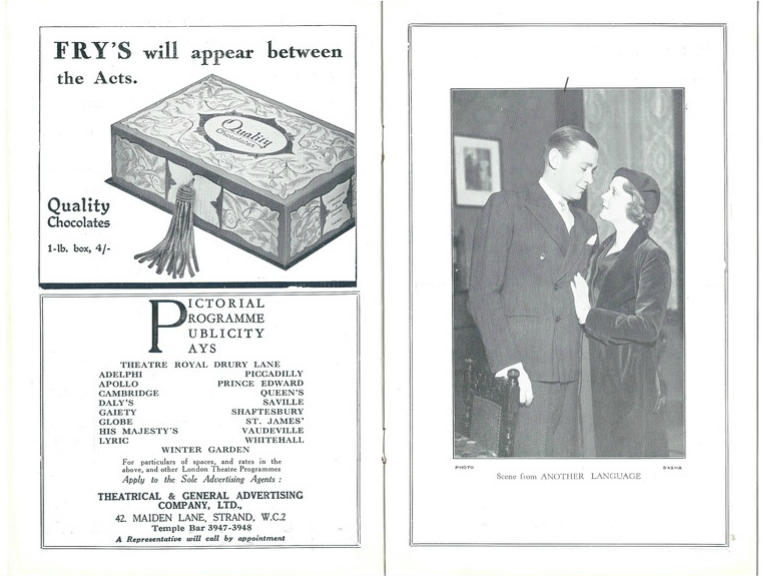 Charles Mortimer as "Paul", together with Dora Barton as "Etta Hallam", his wife. 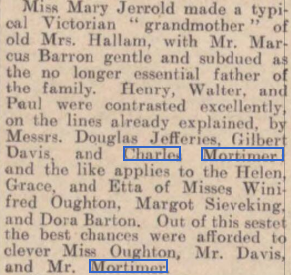 Charles Mortimer 2nd from the left with the family. 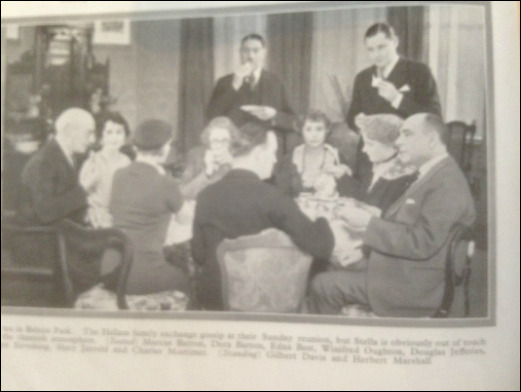 Charles Mortimer 2nd from the left. 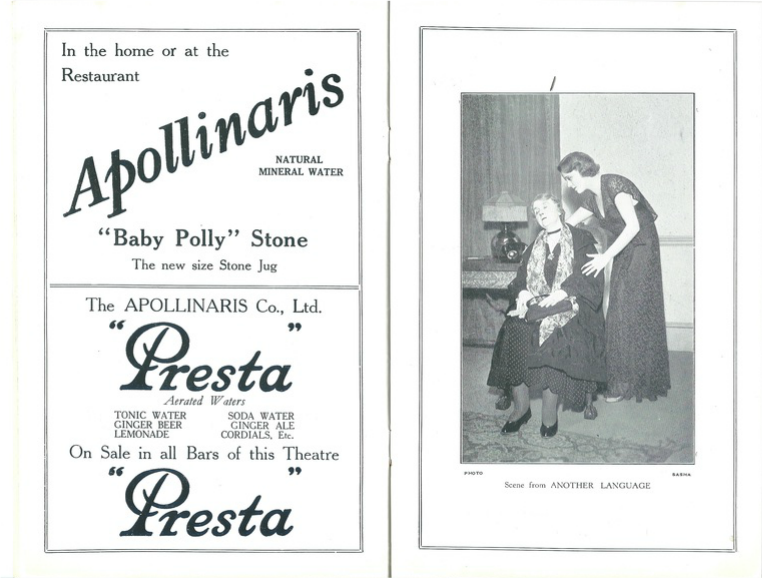 From The Nottingham Evening Post - Friday 18 November 1932. Charles, 2nd from the right. 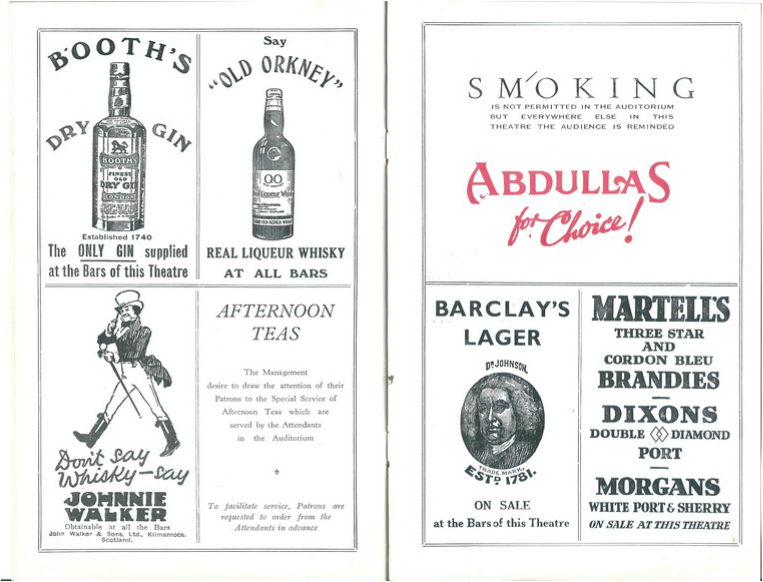 From The Era of 9 November, 1932. 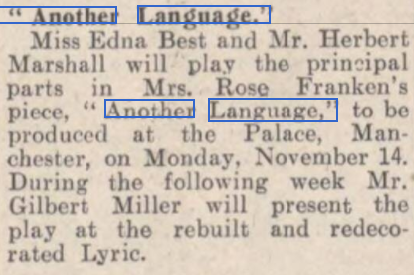 "Another Language”, the Anglicised American comedy in which Edna Best and Herbert Marshall will appear shortly in the West End, is to be produced next Monday at the Palace Theatre, Manchester. 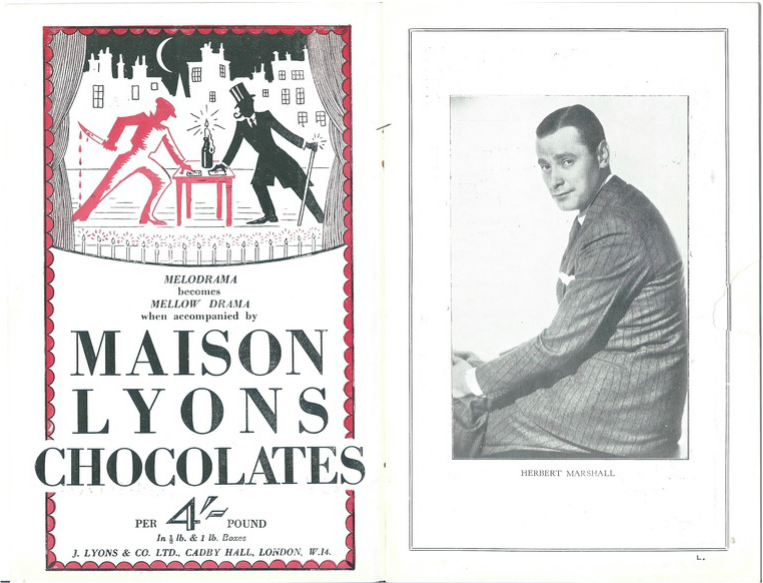 The cast will include also Mary Jerrold, Margot Sieveking, Douglas Jeffries, Louis Hayward, Charles Mortimer, Gilbert Davis, and Marcus Barron. 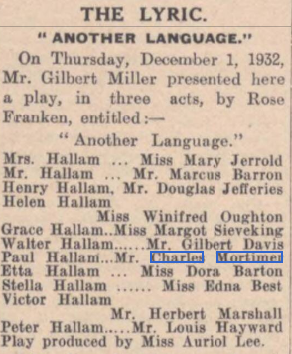 From the Yorkshire Post and Leeds Intelligencer 15 November 1932. 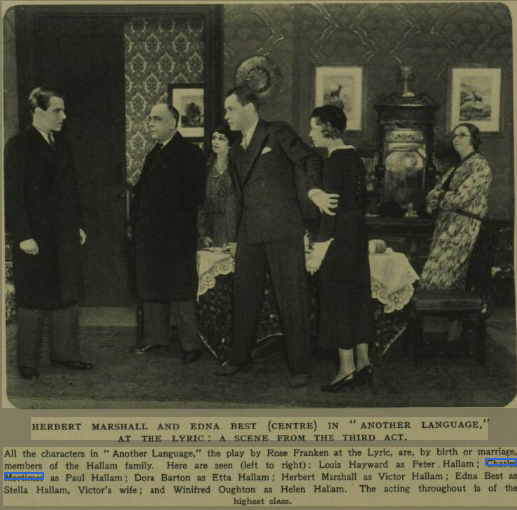 "Another Language" depends for success in great measure upon its acting, for it is essentially one of characterisation. 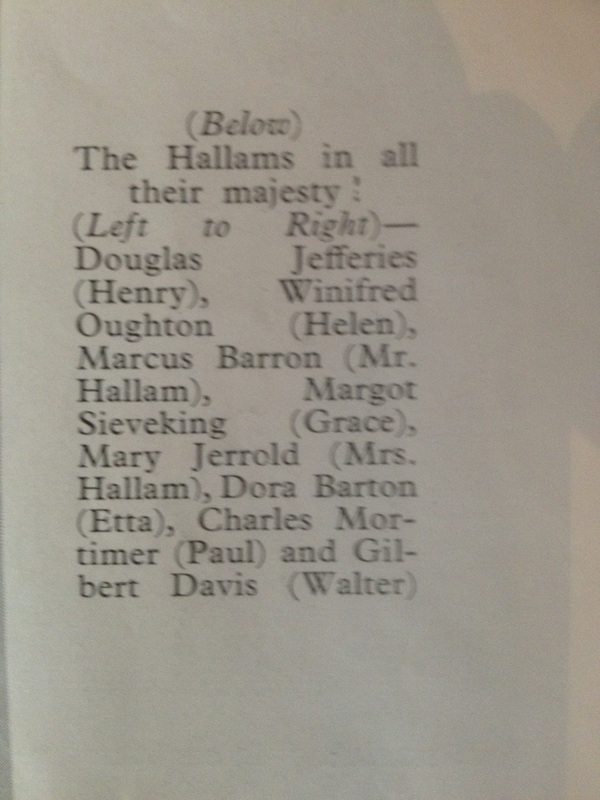 In this respect the Palace company is particularly fortunate, with Edna Best, Herbert Marshall, Mary Jerrold and Winifred Oughton well placed. The play had an excellent reception. 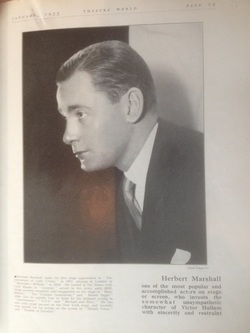 From The Era 30 November, 1932. "Another Language ” will open at the redecorated Lyric Theatre to-morrow night after a favourable advance run at Manchester. 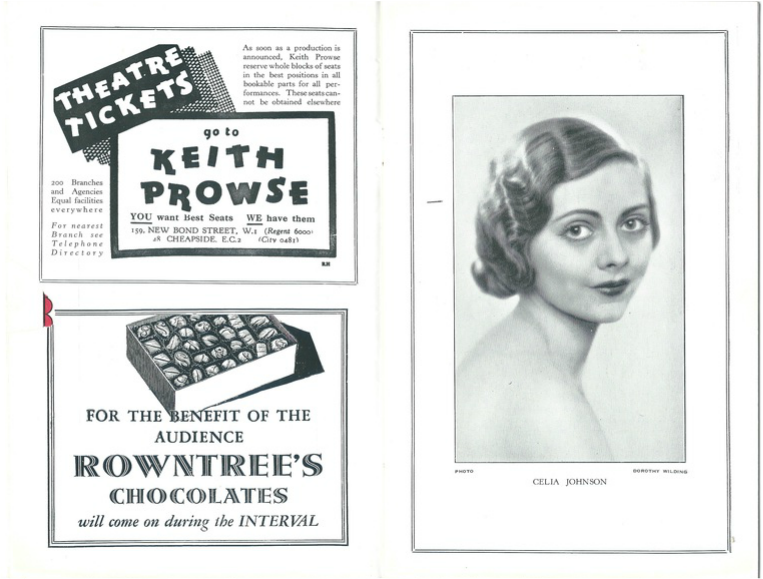 From The Illustrated Sporting and Dramatic News - Saturday 17 December 1932. I presume that Charles is 3rd from the right. 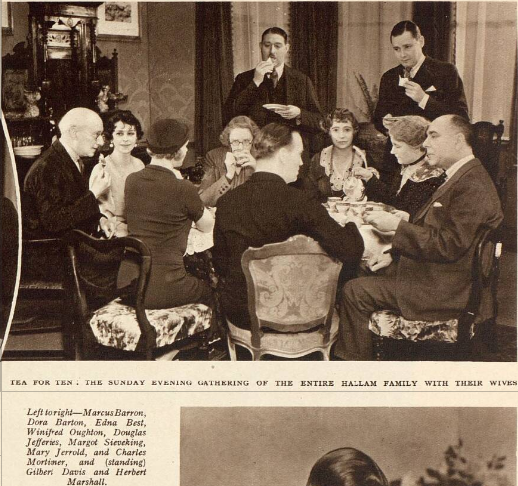 From The The Sphere - Saturday 24 December 1932. 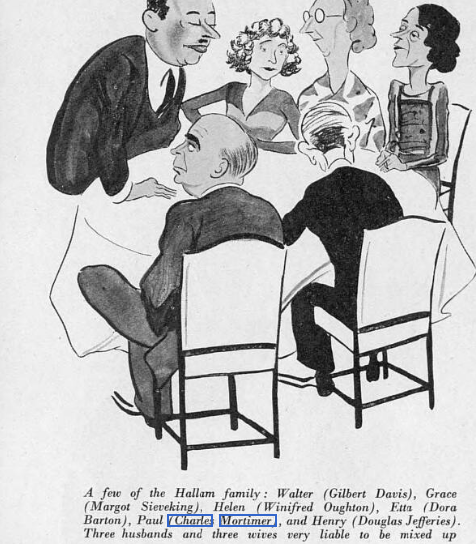 From The Era of 7 December, 1932. 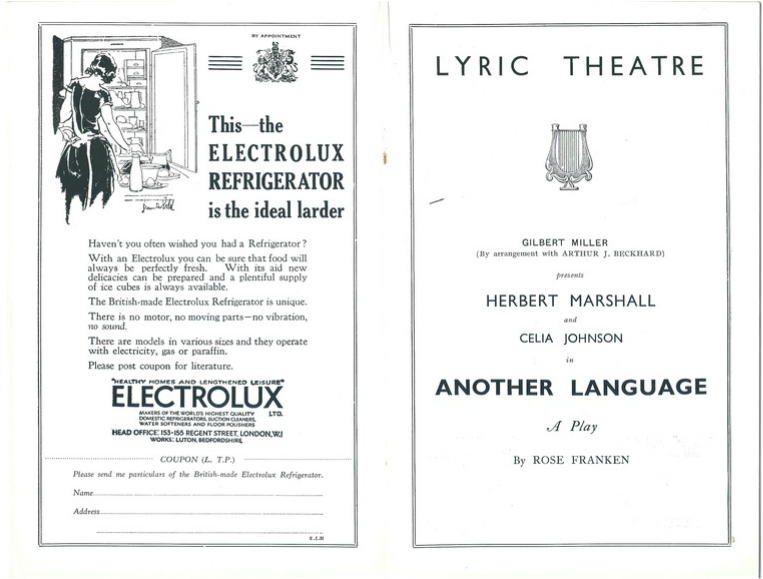 First, a congratulatory word or two about the redecoration of the Lyric Theatre, where this play opened a few days ago. An old fashioned and very miserable theatre has been metamorphosised very agreeably into a semi-modem one. Another Language is a domestic drama which earned my continuous interest. 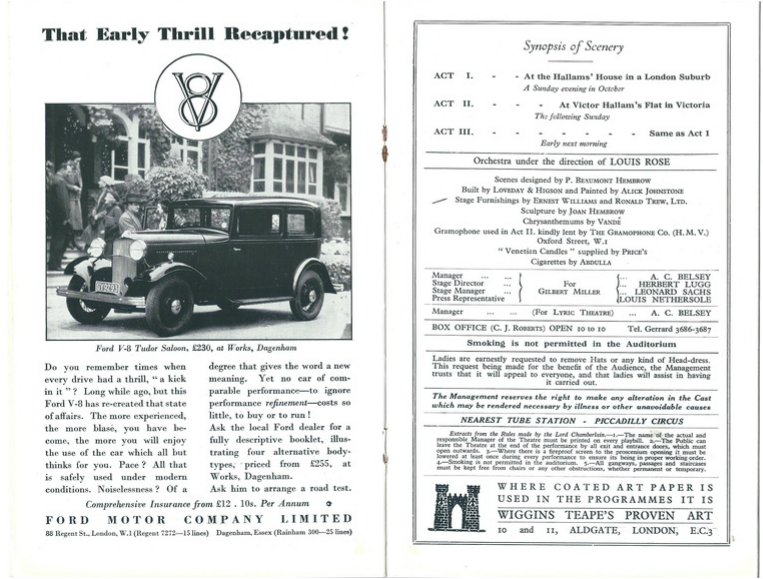 Underneath its veneer of English topography and idiom, one perceives a typical product the American naturalism school. Four brothers clustering around their parents on Sunday nights, bringing their bored wives to tea, while a tyrant of an old lady mother extracts her measure of attention and adoration from them all. One daughter-in-law who rebels from the tyranny of clan and one grown grandson who falls in love with her. A boyish little affair that nearly wrecks a household. That is all there is to it. Rose Franken’s play is so slight that an unwanted responsibility falls on the admirable cast and producer. There was room for an enlargement of our view of this family. But enough of criticism. This is play well worth the seeing. It is exciting and humorous from beginning to end. 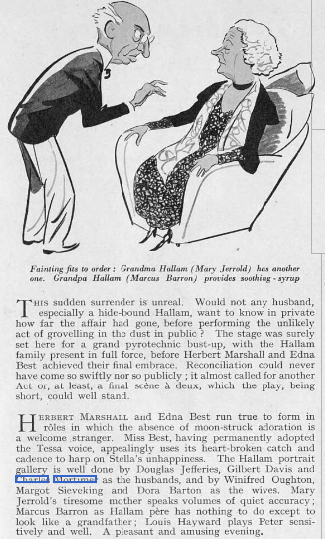 And I fairly revelled in the spectacle of Herbert Marshall and Edna Best (who both appear to have put on condition since I saw them last) having domestic scrap, instead of Mary and Michaelising to the end of their days. They themselves no doubt regard the change as healthy. Auriol Lee’s production is tasteful and slick. 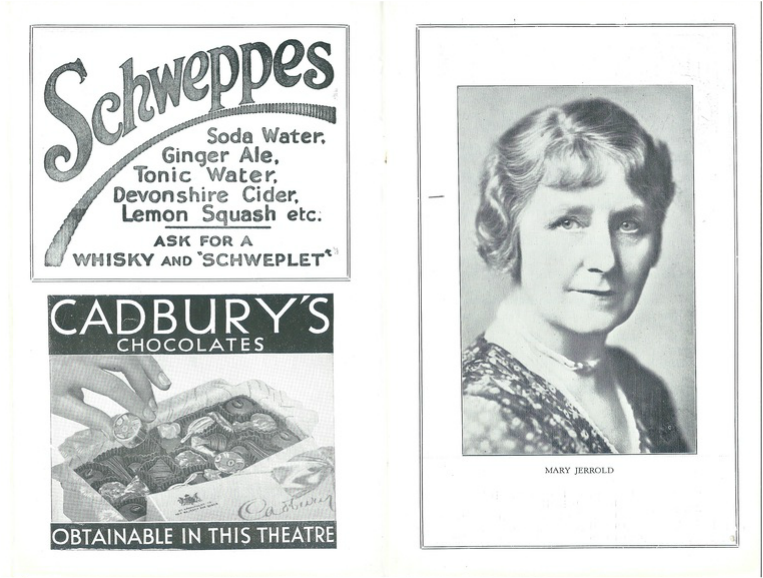 The mother is played with modest brilliance by Mary Jerrold, a lovely performance. 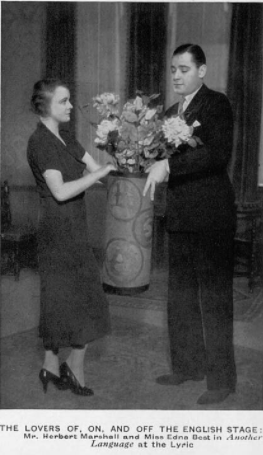 Winifred Oughton makes a very amusing study of the disillusioned Helen Hallam; Louis Hayward is faithful to the role of the adoring nephew. 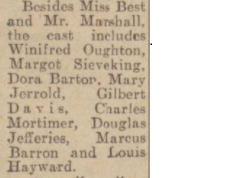 The other parts offer few chances, but Dora Barton, Charles Mortimer, Gilbert Davis, Margot Sieveking, Douglas Jefferies, and Marcus Barron do all they can for the play. 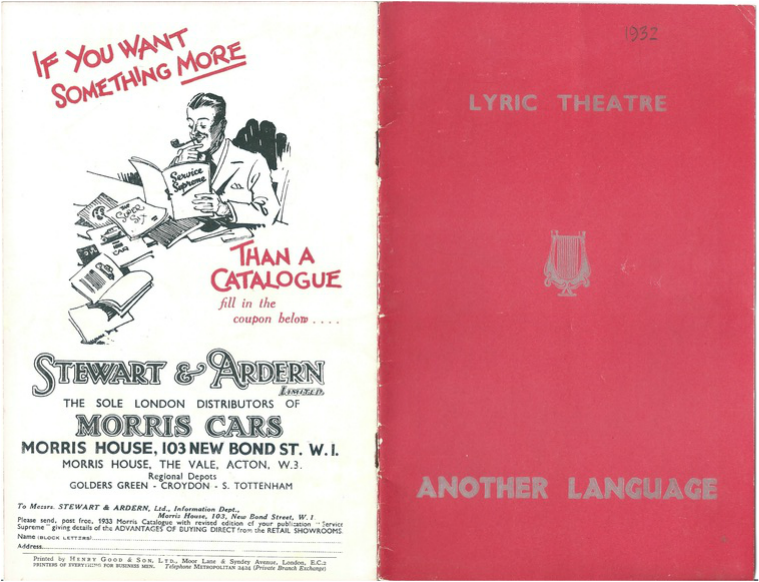 .... and at the Lyric Theatre, London.